HAND PAINTED T-SHIRT " LES PLEUREUSES "..
Ltd edition Unisex Hand-Painted-T-shirts of the french music Band based im Berlin " Les Pleureuses", inspired by the fotograph "Lola Rossi 's work. 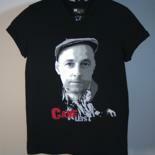 1 x Black T-Shirt 100 % Coton, OECKO-TEX approved, Hand Painted with Professional Textil Paint color Metalic & Textil Glitter. Size avalable : S,M,L,XL,XXL ..
(can be washed in a washing machine 30°) . For more information message me, I will answer you as soon as possible ... HAND PAINTED T-SHIRT " LES PLEUREUSES "..